With the school festival on the horizon, Shino is tasked with writing the script and designing costumes for a play involving Class A. This is a tall order for someone like Shino, so the rest of the girls rally around her and offer their support. It’s during this show of support that Aya starts to reminisce about how some of these friendships first started. With the whole cast back for another go-round, it’s predictably another very good score in the ‘Characters’ category, but let’s discuss these characters in a bit more detail. Let’s cut right to the chase. There isn’t nowhere near enough Karen in this movie. One of the easiest ways to gauge fan interest in specific characters is by visiting their character page on MyAnimeList. I’ll save you the time and let you know that Karen, far and away, has the most member favorites out of anyone in the series with 1,170. Aya (260), Alice (110), Youko (65), and Shino (35) combined can’t come close to the love that Ms. Kujou’s been given on there, so it’s really a shame that she doesn’t have a bigger role in Pretty Days. She—in addition to Alice—are all but excluded during the extended flashback scenes, and even though she has a few memorable moments, for me, they’re few and far between. Needless to say, this also negatively affects the number of scenes with the girl that everyone loves to ship Karen with, Honoka. There’s hardly any interaction between the two, and after seeing their burgeoning friendship in Hello! 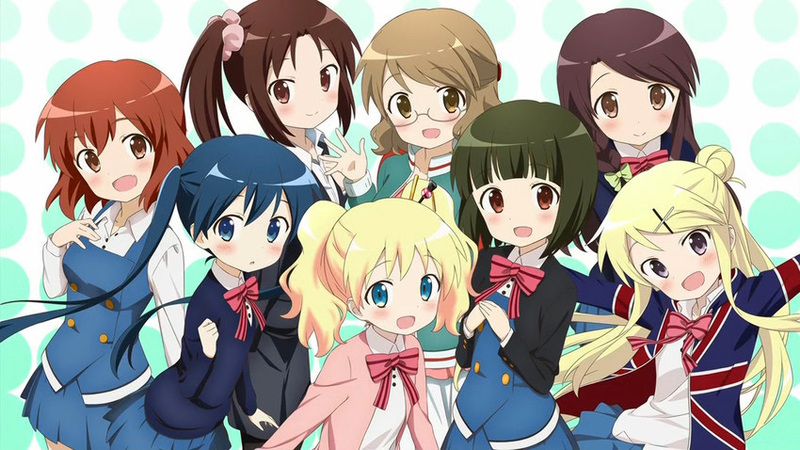 Kiniro Mosaic, this is a bitter pill to swallow. The one remaining pairing, Shino x Alice, probably fall somewhere in between Karen x Honoka and Aya x Youko in terms of screen time, and personally, I don’t really have a problem with that. Remembering those MAL numbers that I mentioned earlier, I guess I’m in the minority when I say that Alice is my least favorite character in KinMoza, and I find her as annoying as she is adorable. I like the fact that she’s so hung up on Shino, but to me, those two just pale in comparison to Aya and Youko. I definitely prefer Shino a bit more than Alice, and just like how it was with Aya and Youko, this movie helped me appreciate Shino a little more. She’s still as into blondes as she ever was, and when we’re not seeing her in her middle school years, that her love of blondes gets a decent amount of play, which is always welcome. One thing I’ve always loved about Kiniro Mosaic are the OPs, and Pretty Days adds another one that features the horns, just like every other KinMoza OP. It’s a sound that’s instantly familiar, and I can’t help but enjoy the hell out of this one, too. The music alternates between cheery and melancholic, and like fellow slice of lifer GochiUsa, the music from this series is just really pleasant to listen to. You don’t really see much variation in the production values of the slice of life genre, and that applies here as well. Luckily, this series has always been above average in that regard, and this movie does nothing to change that. If you’ve enjoyed either season of Kiniro Mosaic—or just cute girls doing cute things in general—then you’re going to like Kiniro Mosaic: Pretty Days. It’s really as simple as that. With the format change comes less time to feature everyone and everything that people have come to love about the series, so the streamlining of relationships, as well as the budgeted screen time of certain characters, may prevent some from loving this as much as the excellent second season, but it’s still very much a satisfying experience that further adds to the franchise’s positive reputation. 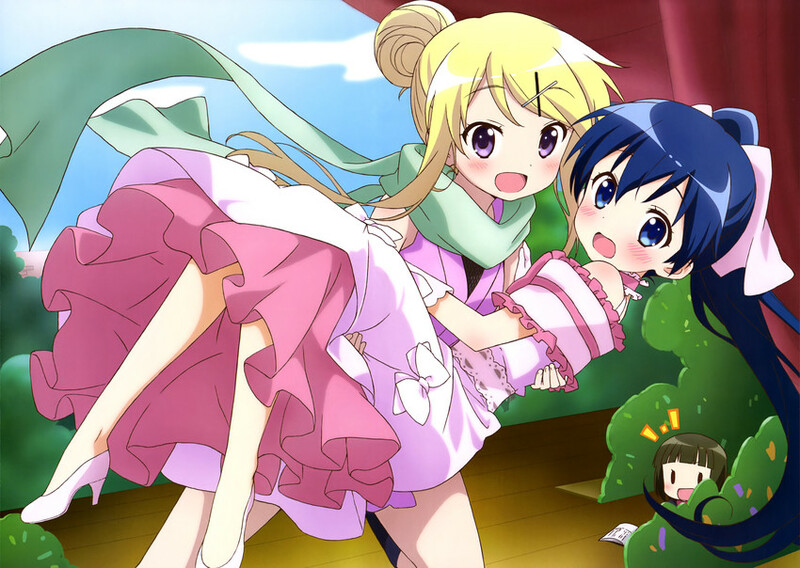 This entry was posted in Anime, Anime Review and tagged Kiniro Mosaic by Rock The Vogt. Bookmark the permalink. It s avaible in English sub? The Ayaya is a legend and this special further emphasized why that is. Can we get a http://www.working!! Review? Depends. Is there enough subtext to warrant a review? An Ayaya focus special. They do care. Just finished watching it and it still lacks lot of Honoka moment! I wish they added our cute brunette into the alchemy. I ship her with Karen to the core! DId I already mention that Honoka is my fav girl from KinMoza? No? Then, I said it! Overall, I wish we got more Aya x Youko and Karen x Honoka and maybe some Shinobu x Alice and Karasuma x Kuzehashi in the future! That aside, i heard that New Game and Gakkou Gurashi are getting a second season soon… Is that true or is that a lie once again. I do not trush my friend anymore because of the Chuunibyo accident (long story, but to summarize, he told me that it was a 80% “yuri” and Sanae/Shinka was official. The heck when i discovered that was a lie). I don’t think this is as good as a third season, but hopefully we’ll get that at some point in the future.